The English Dictionary and Thesaurus by Ultralingua is a reference app. from Ultralingua, Inc. that allows you to look up words without an Internet connection. 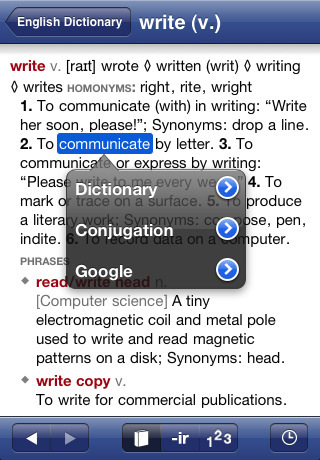 You can look up words in the dictionary section by tapping the book icon on the bottom left hand corner of your screen. When you look up a word, you will get numerous definitions, the Etymology of the word, and any associated/similar words or phrases. For example, I looked up the word “love,” and I was given eight definitions along with forty-seven associated words/phrases (like “filial love,” “love seat,” etc.). I looked up love in the Thesaurus section (you can switch over to it by tapping the tab at the top of the dictionary page) I found twenty-one synonyms for the word in just the first grouping of words that came up. There were over twenty groupings for the word and associated words. Antonyms are also given, but in smaller numbers. There is a button right next to the dictionary/thesaurus one that says “-ir” that is for conjugating verbs in English. The app. 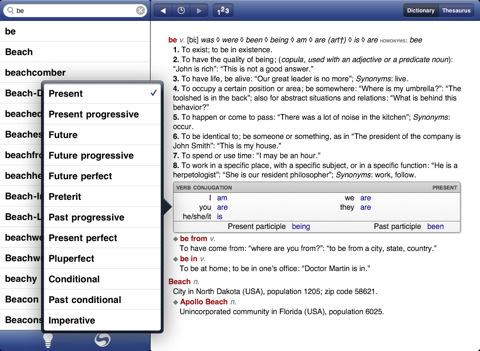 automatically pulls up the Present/Present Participle/Past Participle of the verb you are looking up, but you can pull up eleven different additional tenses besides those three- everything from the Preterit to the Imperative. There is a tab next to the conjugation tab with a “123” on it that helps you translate numbers from digits to texts. I know some people who have trouble writing out large numbers when writing a check, and this could make that problem go away. So in this section, “1234” becomes “one thousand two hundred (and) thirty-four,” etc. The app. also keeps a history log of all of the words/numbers you have looked up recently. You can arrange them from A-Z or Z-A, and you can edit them by deleting those entries that you no longer wish to appear in the log. You can also delete the entire history by tapping the “Clear” button in the bottom right hand corner of the section. On either side of the history tab (that looks like a clock) on the main menu, there is a back and a forward button so you can easily skip back and forth between the words you already looked up. If you press the Ultralingua icon in the top left of the main screen, it will take you to an “About” page that has a link to the quick reference guide for the app. I don’t know that you’ll ever really need it though; the app. is very clean and easy to use. Here is how the iPad optimized version of the Ultralingua English Dictionary and Thesaurus app looks like. You get both versions when you buy it. I don’t have any complaints about the way the app. functions, and as a student in a University I find this type of reference app. to be extremely useful and necessary. However, and I probably should have told you this first, the app. costs $9.99. But, after using Ultralingua, I’d say it is pretty worth it. It costs less than a good dictionary and you can find what you’re looking for faster. But I can understand how the price tag may deter some people. If you are happier leafing through pages than typing a word into your device, then you may want to pass. AppSafari review of The English Dictionary and Thesaurus was written by Tyne Kennedy on May 25th, 2010 and categorized under App Store, Education, iPad apps, Productivity, Reference. Page viewed 5404 times, 1 so far today. Need help on using these apps? Please read the Help Page.